Commitment: Fund 12-month project to establish sustainable maternal and reproductive health education services. Slums, sprawling low-income areas on the outskirts of cities, are the fastest growing population centers in the world. In Kampala, over 2/3 of the city live in low-income slums where health conditions are poor and the availability of medical services is limited. The purpose of the Maternal Healthcare Project is to promote the maternal health and wellbeing of women and young adult girls through sustainable maternal and reproductive health education in the slums of Makindye Division, Kampala City. Slums areas represent a unique challenge for maternal health. Maternity clinics are often dangerous and unlicensed or far too expensive to access. As a result, 30% of mothers still deliver at home. Those that do go to clinics, often receive low quality care that contributes to high rates of maternal mortality. It is worth noting that 30 % of households in the capital Kampala are run by women. As such, reducing the maternal death rate and improving the health and wellbeing of mother's and their children will have far reaching effects, both societally and economically. Increase the number of women accessing maternal and reproductive health services through subsidized medical support, including health checkups, medicine, diagnosis and referral services. Increase the level of awareness and knowledge about critical health issues, such as HIV/AIDS, preventative maternal and reproductive health, family planning, and unplanned births. Increase access to skilled birth attendance at delivery through a community midwife referral system. 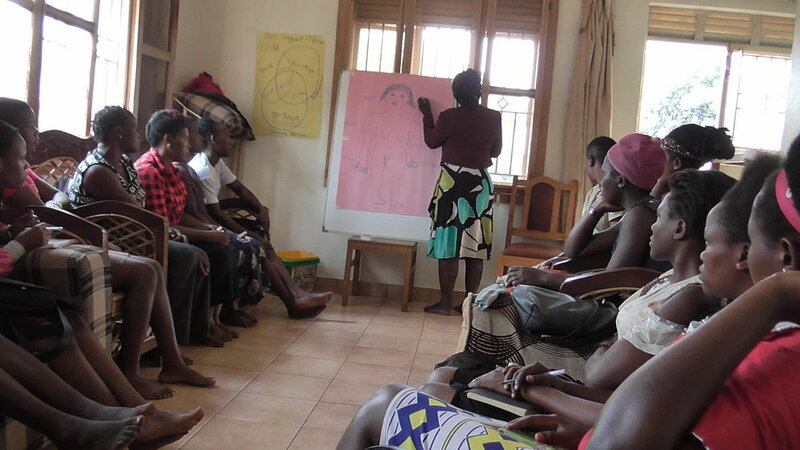 The Maternal Healthcare Project targets women and adult girls aged between 18-30 years. The project expects to reach 500 women and 500 young adult girls. The project is design to indirectly target male and female companions as well as adolescents and children of all households to raise awareness on preventive health care, hygiene and health rights. Expectant women retreats - Through these workshops women will be equipped with up to date information about pregnancy and child birth. Lack of proper information about the health of a mother during pregnancy can lead to lots of dangers to both mother and child. One way of reducing maternal and neonatal death is furnishing expectant parents with the right information. Formation of expectant women’s group - Expectant mothers will be recruited and then meet in groups to discuss the key aspects of care during pregnancy and the care of the newborn. During this activity issues discussed include, postnatal infections, cord care, prematurity, breastfeeding and nutrition which are all key child survival aspects. Breastfeeding advocacy - Breastfeeding is a key child survival element. In Uganda although almost 80% of the children are breastfed, key breastfeeding practices like early initiation, exclusive breastfeeding and prolonged breastfeeding for up to two years are poorly practiced. The project will work with other stakeholders on breast feeding as a child survival strategy. Establishment of Referral networks - for specialty care, such as antenatal, infant health care, obstetric fistula repair and cataract removal. The organization will identify community health centers to work with. 80% households will receive support on preventive health care measures through training and educational sessions. 80% of the women in the slums will have access to maternal and reproductive health services. 90% of all pregnant women with receive comprehensive ante natal services such as TT immunization, regular periodical checkup, vitamin & iron supplements, counseling about nutrition, screening of high risk cases. Increase in institutional deliveries to at least 80% of the total births. A substantial increase, reaching up to 80% in the coverage of children under immunization against the six vaccine preventable diseases and administration of Vitamin A. Increased overall health awareness and better health-seeking-behavior among the slum dwellers, reflected in reduced morbidity pattern, better management of diarrhea and acute respiratory infections in children in the slum areas. Rainbow House of Hope Uganda was founded by young two friends in 1998, and fully registered in 2002 as a Non-Governmental Organisation to give life skills support to underprivileged children and youths in Nsambya, a semi slum suburb in Kampala, Uganda. Rainbow is working towards young women’s empowerment, life skills education, education sponsorship, youth talent development, youth Brass band training, and livelihood and Maternal & Reproductive health promotion. Rainbow aspires to improve the living conditions of the poor single mothers and marginalized by adopting strategies through community initiatives, participation and sensitization. It has worked with over 2750 children and youths being educated in both formal and informal education. This has been possible with individual support from both local and international friends.